Our New Low Profile Solid Stainless Steel Pedestals are easy to clean with no screw heads as well as adding a sleek clean look. 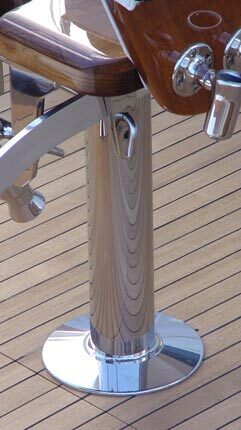 These pedestals are computer machined on CNC Lathe and then are high polished to a mirror finish. 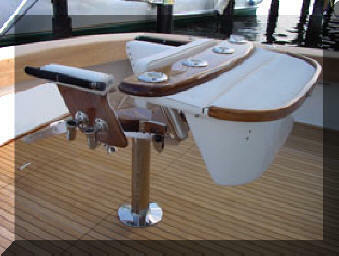 Our Rocket Launcher is made from hand selected Burmese Teak. It has a 9 gallon fiberglass insulated bait/drink box added to it with a hinged lid which acts as a rigging tray when closed. It can be added to your existing pedestal or in place of your backrest on your chair. This offers a great solution for keeping coolers off the deck and keeping your bait in the box at a height where you can rig easily. It also features quick release drain holes on the bottom for easy clean out. IF IT IS THE LAST COST!! !